Hands. You can’t tell a mole anything about hands. That’s what we are, a pair of hands attached to a little furry body. So when this artist says she’s got an exhibition of paintings of hands at an Oxford college I thought I’d give it a go. The hands were all right, but those lawns! I couldn’t wait. Certainly left my mark there. 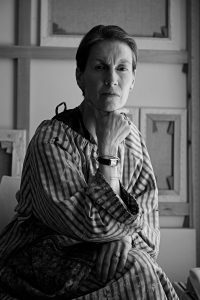 Patrice Moor, aged 58, has her ‘Many Hands’ exhibition currently on show at Somerville College. The college, founded in 1879, was one of the first women’s colleges in Oxford. Since 1994 it has had equal numbers of men and women as students. Her exhibition is a series of fifteen paintings, each 18″ x 14″, combining oil and pencil on a white background, the result of a residency she had there in 2016. The result is a cross-section of Somervillian hands: Somerville’s students, a librarian, the college principal, a gardener, a porter, a chef and a four-year-old boy attending Somerville’s nursery. Interestingly, Somerville is the first college in Oxford to have a nursery. So how does an artist become an artist in residence? You knock on doors. Patrice has had residencies at the British Optical Association Museum, the Royal College of Physicians and the University of Oxford Botanic Garden. All done by asking. When you see the quality of her work, you realise why they snap her up. And here is the mystery. Patrice is a self-taught artist. Patrice had an interesting upbringing. Her mother was Dutch and her father was from Luxembourg. Her mother died when she and her brother were very young. Her father was a diplomat so they moved from place to place and from school to school. The result was a solitary, studious child who blossomed when she came here to a language school in Oxford at nineteen. She loved the relaxed way of life here. It was not the bourgeois society she was used to. She then moved to London and was a Primrose Hill nomad for a while, living in Gloucester Avenue, Princess Road and Ainger Road while she completed a first degree in History and French Literature at King’s College London and went on to do a Law degree. No sooner said than done, Madame (Madame by now had three children). Her husband bought their present house before she had even seen it. It didn’t seem to matter. They have lived there happily for twenty-four years. So how did the painting start? “By accident. A very dear friend gave me a box of watercolours and a sketchbook. I started playing around. I had never done anything like this in my entire life. I just played with different materials and different ideas. I wasn’t very good at first. I improved. That is inevitable.” Easy to say that. Me, I’m brilliant at digging, but ask me to do anything else and I’m rubbish and I’ll stay rubbish no matter how long I keep at it. So there must be something special about this Patrice. Patrice has recently started a residency at Lincoln College, Oxford, where she will be having an exhibition in the autumn of 2018. She is also working on a book of her collages in collaboration with an artist in Amsterdam.